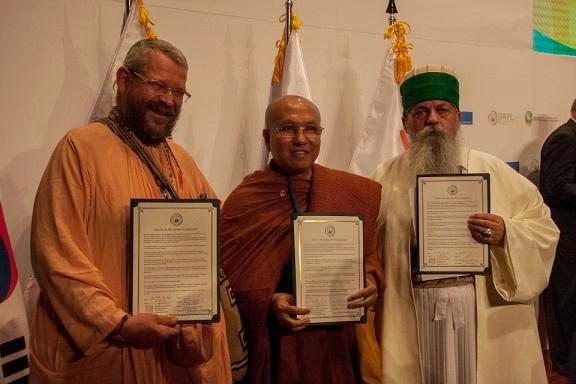 http://warpsummit2014.org - Last week, from 17 to 18 September 2014, a Vaishnava spiritual master, Srila Bhakti Aloka Paramadvaiti, direct disciple of Srila A.C. Bhaktivedanta Swami Prabhupada, participated in The World Alliance of Religions’ Peace Summit (“WARP Summit”), which was held in Seoul, South Korea. 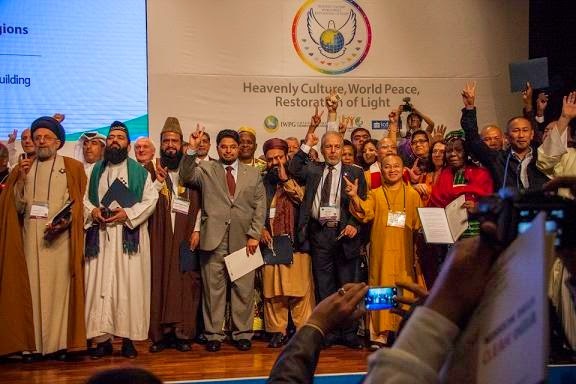 This event was hosted by Heavenly Culture, World Peace, Restoration of Light (“HWPL”), and its two subsidiary organisations, the International Women’s Peace Group (“IWPG”), and the International Peace Youth Group (“IPYG”). 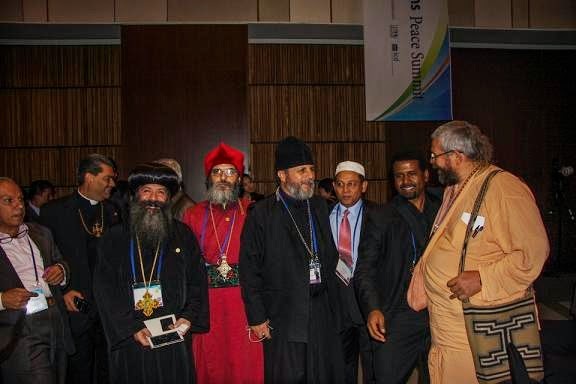 The WARP Summit was first and foremost a meeting held between different leaders of the world, including prominent figures in both secular and spiritual sectors of society, in order to discuss and share insights on how to achieve world peace. The summit was being organised in the hopes of creating a platform for dialogue between community leaders on national, cultural, spiritual, and ethnic levels. Such dialogue will pave the way to the creation of a universally applicable value system, reflected and implemented across all perceived social boundaries through an international law designed to eliminate war-activity from our world. In order to achieve this goal, the summit had two focal points. First, it took place the discussion and signing of an agreement for cooperation between leaders of essentially secular communities (countries, cultural, and ethnic groups). Secondly, there were a discussion with religious leaders regarding the ways in which to align the fundamental value systems of each represented religious teaching such that its doctrines might no longer be used to promote violent behaviour. This unified system of values, applicable to all religious systems, is what HWPL refers to as the World Alliance of Religions, or the unification of religion. 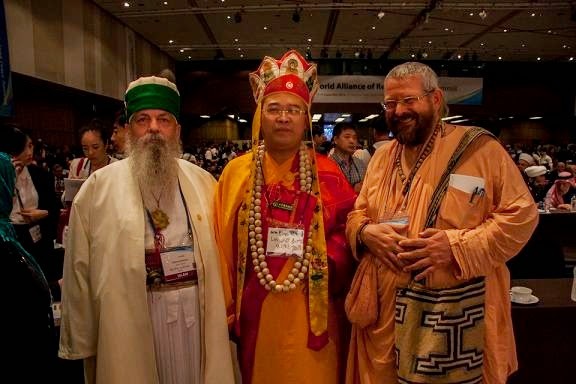 Days ago, a Vaishnava spiritual master, participated in The World Alliance of Religions’ Peace Summit (“WARP Summit”), which was held in Seoul. Srila B. A. Paramadvaiti Swami, founder of the “Vrinda Family”, was invited to go to South Korea in order to join many other religious leaders around the world in this historic event organized by Heavenly Culture, World Peace, Restoration of Light ("HWPL"). This is an international organization, with headquarters in Seoul, Republic of Korea (South Korea), whose mandate it is to see the cessation of wars. It pursues this goal through a number of avenues, namely the International Peace Youth Group ("IPYG"), and the International Women’s Peace Group ("IWPG"). "Without proper and friendly discussion, the social boundaries of ethnicity, culture, nationality, religion, and language will continue to pose a threat to the security of our future, as these differences are easily exploited to encourage violent behaviour." ... "Our work is motivated by a unique vision for peace centering on the establishment of a new and universally applicable set of values. This is the heavenly culture - something which has been promised to man through every religious and ideological ideal, " explains Man Hee Lee, Chairman, of HWPL. Such an alliance of ideologies, which until now have been responsible to an untold number of conflicts, would enable us to leave a legacy of peace and life to future generations instead of the death and war which now besets our world, say the organizers of this global event for peace. This kind of international meetings for World Peace will help cementing the bonds of unity, harmony and brotherhood. These goals can easily be achieved when we realize that we are all spiritual beings in material bodies, all children of God and we should not be forced to adhere fanatically to religious or ideological restrictions which only make humans to stay away from each other. (Editor's note).